This is Mediterranean Lunch Bowl recipe and content is a sponsored post written by me on behalf of Minute®. 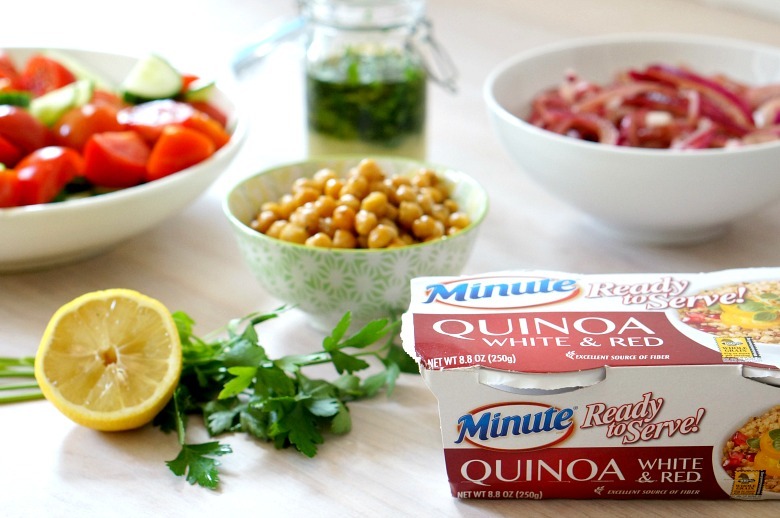 I received samples of Minute® Ready to Serve White & Red Quinoa to use in this recipe I created for you. 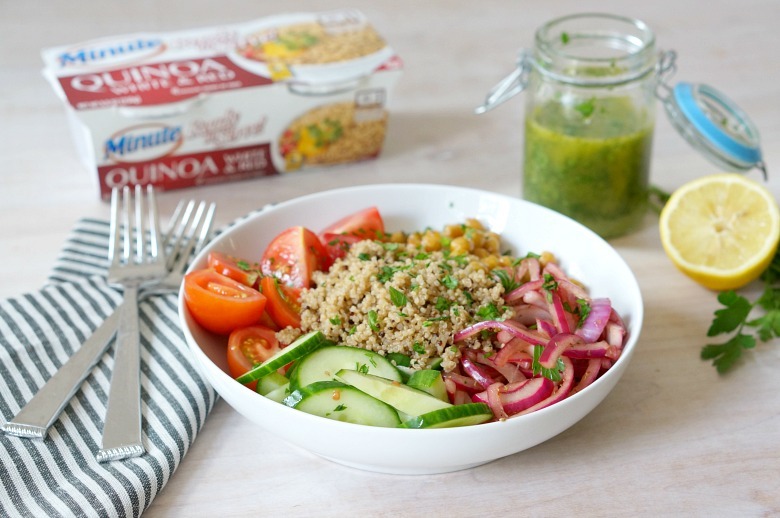 Power through your day with this veggie and protein packed Quinoa and Veggie Mediterranean Lunch Bowl! 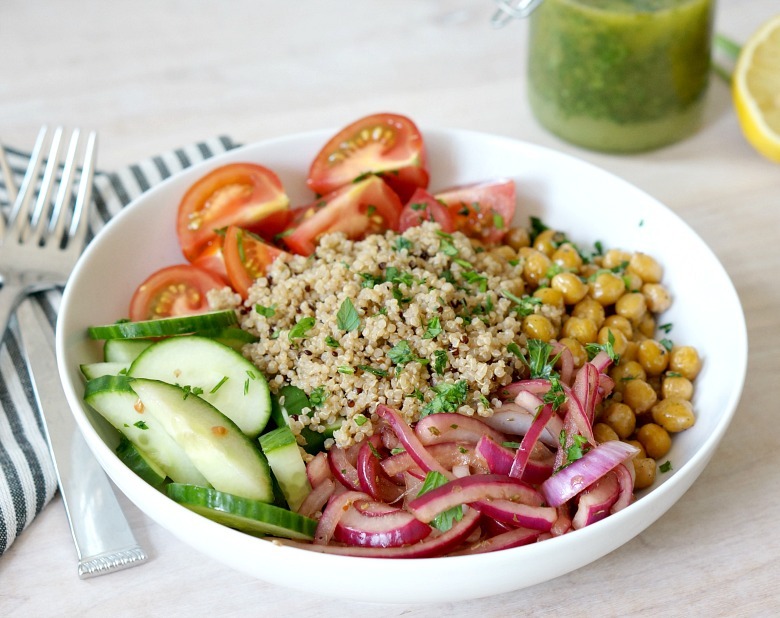 Dairy-free, vegan, and full of flavor, this easy grain bowl will become a lunch-time favorite! I’m soooo loving the flavors of Mediterranean food right now! There are tons restaurants opening up in my area offering grain bowls, spiced chicken dishes and rotisserie lamb, and I’m getting regular cravings. Ordering Postmates to get my fix isn’t really in the budget, so I’ve been hanging out in the kitchen trying to nail down a perfect Mediterranean dish. Although I’m sure I’ll be working on a few more dishes for y’all (ahem… moi) I’m pretty darn happy with this Quinoa and Veggie Mediterranean Lunch Bowl. The dressing is spot on. The ingredients are easy to prep. 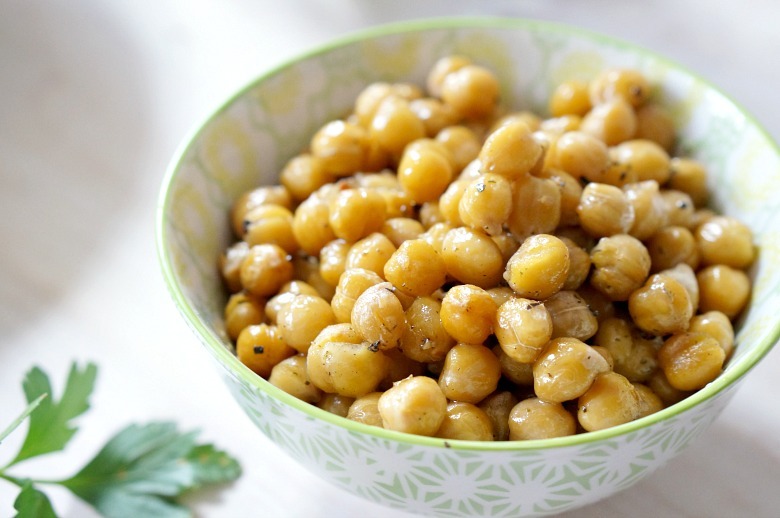 And, although packed with protein from the quinoa and garbanzo beans, it’s vegan, which leaves me feeling fueled for the day without being weighed down. 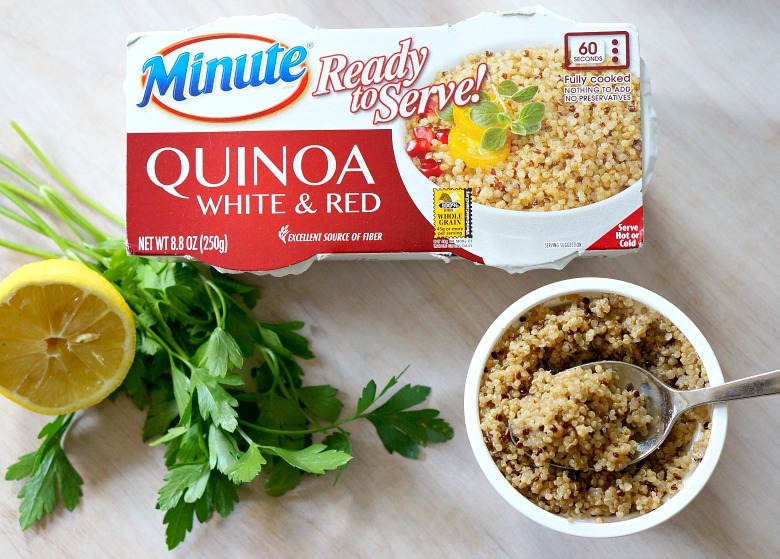 Have you guys seen the new Minute® Ready to Serve White & Red Quinoa? These individual portions of pre-cooked quinoa are perfect in this recipe; no cooking required! Just prep and add a few other ingredients and you have the perfect grab and go lunch. You’ll be sure to draw envy from your office-mates or fellow playground-mommas as the case may be! This recipe is comprised of several individually prepped veggies and proteins. Feel free to omit anything you don’t like or don’t have on hand, but the magic comes when it all is blended together in the bowl! Pour two tablespoons of olive oil in a rimmed sheet pan and place in the oven, in a middle rack while it preheats to 425 degrees. Meanwhile, rinse and drain one can of garbanzo beans. Season with a hefty sprinkling of salt and grill seasoning if you have it (if not, pepper and oregano should do the trick). Once the oven has preheated, remove the sheet pan from the oven and carefully pour in the seasoned beans. Careful it’s hot! Return the pan to the oven and bake about 20 minutes, shaking occasionally, until golden and crispy. Allow to cool to room temperature until ready to use. You’ll get about four servings for our Mediterranean Lunch Bowls. 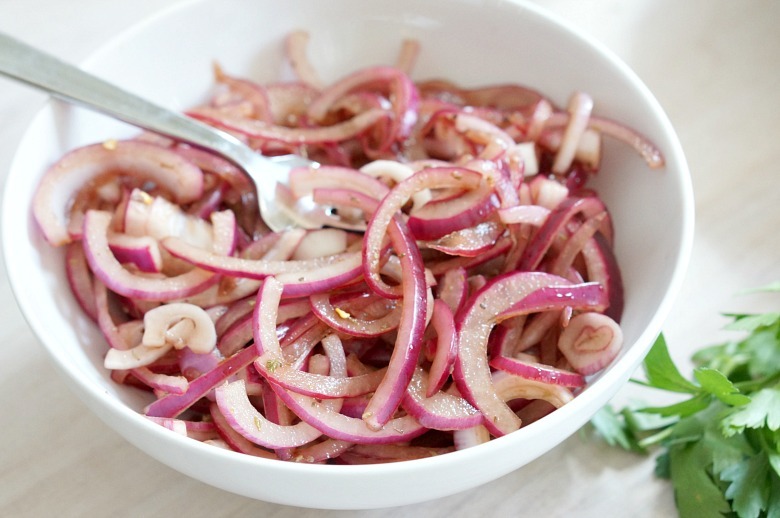 Peel and slice one red onion thinly. Add the slices to a medium bowl and add one tablespoon sugar, 1/4 cup red wine vinegar, a large pinch of salt and a sprinkling of red pepper flakes. Mix well with tongs and allow to marinate for at least an hour or up to several days in the refrigerator. You’ll get about four-six servings for our Mediterranean Lunch Bowls. 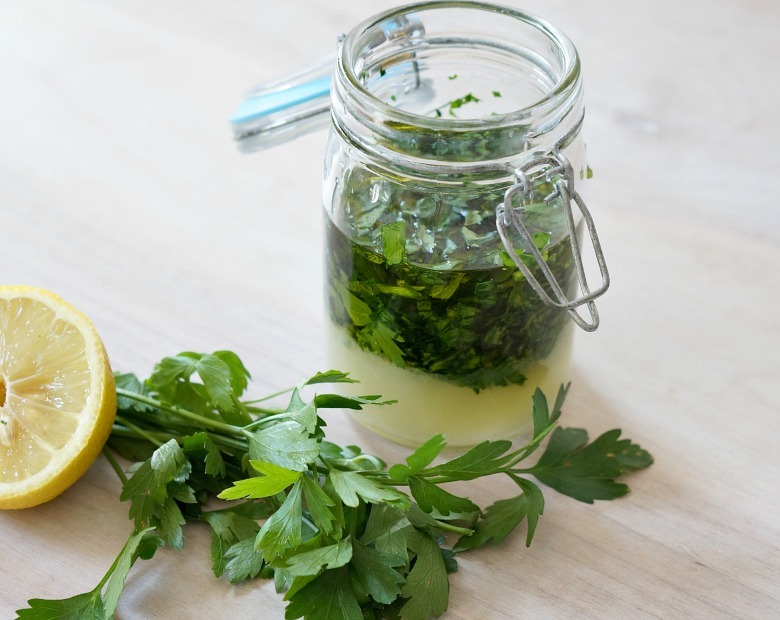 Combine 1/2 cup olive oil, 1/4 cup freshly squeezed lemon juice, 1 tablespoon freshly chopped parsley, 1 tablespoon freshly chopped mint, 1 teaspoon of salt and a few grinds of pepper. Store in the fridge for up to a week, shaking vigorously before using. You’ll get about four-six servings for our Mediterranean Lunch Bowls. To an individually-sized salad bowl, add one portion of the Minute Ready to Serve White & Red Quinoa. Add in some sliced cucumber, quartered cherry tomatoes, and then the prepared roasted garbanzo beans and pickled red onions. Top with a few tablespoons of Lemon Herb Vinaigrette. I hope y’all love this recipe as much as I do. And, if you are looking for more lunch time recipe inspiration, be sure to click here! If you love this Mediterranean recipe, be sure to try this other fab veggie recipes including this beautiful Ombre Summer Salad and these super-addictive carrot fries!